Well, it's been over a year since I last played around with my Lego ray tracing and even longer since the last time I traced a new model. Well, 'tis the season to build new models! 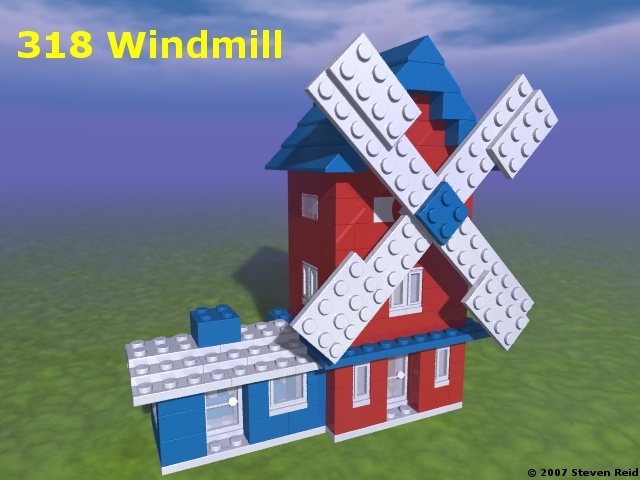 I did some searching around and found a model from 1969: 318 Windmill. Yes, it isn't a large model. However, it is a bit different. For one, I turned on shiny bricks. I know, it's been years since I bothered. But this model just looks better with it on. Note that I also turned on bumpy slope (roof) bricks. I didn't like the way it looked, so I turned if off again. I also added some new pieces to the library. Probably the biggest change, though, is the color differences. In searching around, I found a great site called Peeron.com which lists an Official LEGO� Color Chart. Most of the colors I have today were taken from earlier libraries I had used and my best guess. Using an official library was intriguing, so I've converted my color library to use the standard set. I was skeptical at first, but I actually like the new colors. So, for now at least, I'm using the new pallet for my images. You never know, though. I may change my mind later!